So I export the file from the OLD website……then go to ‘Login to admin panel’ from GCP but of course it takes me to the same WP site (the old one) as everything is pointing in that direction now. No idea how to get to new WP site to import the file…….. These changes take a while to take effect (learn more about DNS propagation). Additionally, try viewing your website through a free proxy service in order to bypass your browser’s cache. We got around this OK. However, we had the problem that we no longer could receive email after changing the nameservers. We only wanted to move our website host and keep the email hosting separate…. Are we doing something wrong such that our mail host is being affected by changing our website host? I understand your situation, and I’m not sure the best way to go about hosting your email and website on separate servers. This is something you should contact your existing web host about. Check out this Stackoverflow thread for more information. I hope you’re able to get it worked out, and let me know if I can be of assistance! Its strange, as when we moved the website to GCP we didnt touch the MX records and only the DNS as instructed…..and yet it interfered with the ability to receive email. Hi. Thanks for this. Running into an issue. After I migrate all internal pages result in an error. Home page is fine. Internal pages don’t work. Any ideas? I’m not sure what the issue is – can you describe it in more detail? Are your permalinks returning 404 errors? Yes. But the 404 page is not my site’s 404 page. It the basic Google Cloud error page when nothing resides there. I’m going to try it again today. I’ll let you know the IP so you can see what I’m talking about. It sounds like a different issue – definitely not what I was thinking of. Let me know how it goes! After importing the website I an unable to login to WP, showing errors as password doesnt match, and when I try resetting the password, shows email is not registered. Upon importing into GCP instance I receive an error which says that my site exceeds the maximum allowable file size (100mb); which is odd because this is a very simple and sparse website with just a few blog posts. So how can I either reduce the size of the file, or overcome this error in some other way? How are you importing it? 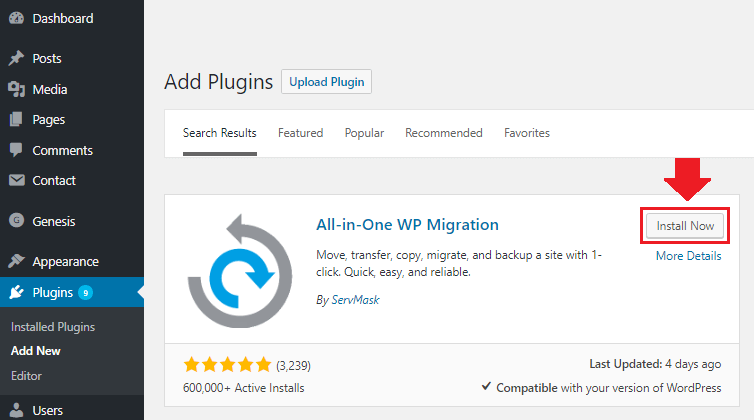 Via the All-in-one WP Migration plugin? Please provide more details and I will see how I can help! Right now my new Worpress Instance resides at an IP# address on GCP until i make sure it all works fine, then I will point the DNS to the new IP. But, none of the links are working, even after saving the permalinks part. I have even installed a permalinks finder app that doesn’t seem to be working. Please advise if there is a way for me to fix this. or if pointing the correct domain will fix the issue. Old website was http://kendrew.ca, the new website is http://104.155.185.136/ for now. Follow this guide is the problem I guess? The blogger here also has no solution to this? 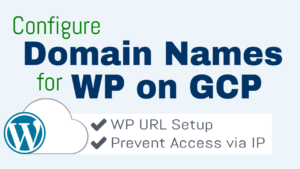 If your IP is showing instead of the domain name, it’s because either your site URL’s are not configured properly in your wp-config.php file or your DNS settings are not configured properly. Regarding links not working, I go over the solution here. Glad to hear it worked – thanks for letting me know! Link 404 is fixed, but when clicked on the home item in the menu. It reloads with the ip address. I connected via FileZilla following your other guide. Connected by can’t find the wp-config file under wp-content folder. Make sure your URLs are pointing to your website’s URL, and not your VM’s public IP address. Great Tutorial and Post ever I have seen. Many many thanks for sharing such great Tutorial keep it up, god bless you. How can I migrate my WordPress multisite almost 13GB data easily. I am too much confuse about proper migration. If you have any way please share with me complete start to end details. First check out this guide and follow steps 1-4. To migrate a website of that size (13GB), you will need to unlock the unlimited plugin, as instructed in this comment here. Next, configure Cloudflare CDN and SSL. In step 3 of the tutorial, use the “Full SSL” setting, not the “Full SSL (Strict)” setting. This will allow you to use Cloudflare’s SSL on your website. WordPress Multisite is an entirely different application. Unfortunately I don’t have any Multisite tutorials available at this time. That being said, I would recommend checking out the Bitnami WordPress Multisite docs here. Followed all the steps, however, after importing, it only imports home page and cannot access wp-admin any longer. Please provide additional details regarding any error messages/notifications that you are seeing that pertain to the error. This will help me to guide you to a solution. The export seems to work, the import seems to work on GCP, but when I go to access the newly imported WP-Admin, says page not found. It seems to have only copied the home page and nothing else. I should clarify it’s website hosted at Blue Host and I am trying to transfer to GCP. Google gave an IP address so I can point the domain (hosted at Google) to the new IP address. I’m not sure what the issue is – worse case, you will have to migrate the website manually. If your website has lots of plugins and/or uses a ‘drag-and-drop’ builder, this could be a contributing factor. I would deactivate as many plugins as possible and try again. Also, make sure your domain name is configure properly with Google Cloud, as it appears to me that it could also be a networking issue caused by an incorrect DNS configuration. There are really no plug-ins. I am trying to now manually move over…under GCP where can I manually move over the website files? FTP? Do it with SFTP through FileZilla. Also, search Google for a tutorial on manual WordPress migration – there are a lot of them out there. 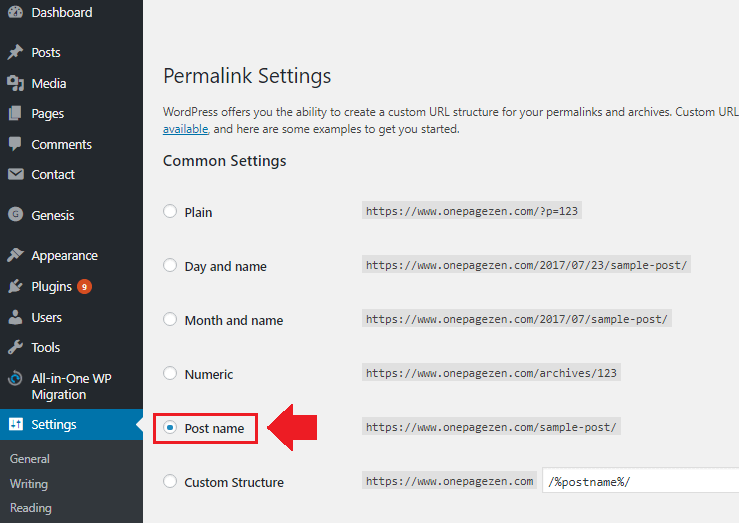 How change the configuration of the instance after I deploy WordPress? You have to first stop your VM instance, then click on the VM instance and click the “edit” button at the top of the page. Remember to reserve a static IP address for your VM instance before stopping it, or your website’s IP will change after the restart. Is this tutorial on transferring a WordPress site? (You make it sound to easy to be true) Could you please go in more detail on ‘Permalink’ section? Specifically will I be able to keep the same url after this process is done? ? It’s a tutorial on how to quickly transfer a WordPress site to a new WordPress installation on Google Cloud. I don’t know the reasoning behind having to reset permalinks, but it’s a recommended preventive step in order to avoid issues with incorrect permalinks down the road. And yes – this tutorial is meant for users who are using the same URL, as the process is slightly different if the URL is different at the old/new location. This was a great video. just a silly question, why is URL not same as that of my existing word press site? I don’t quite understand your question – did you URL change after you uploaded the site? I ran your page in GT Metrix and didnt’t see any major issues. The first thing I would do is configure a CDN; CloudFlare has a free one that you can use in conjunction with W3 total cache, which, when used effectively , can greatly reduce your website’s load times. If you’re an experienced developer and have funds to pay for premium services, I would skip CloudFlare and use Google’s own CDN and cross-region load balancing service. This is where Google Cloud Platform really shines, and you will find the biggest performance boost to your website – much greater than Cloudflare’s free service. Check out this video for an introduction to GCP’s CDN and load balancing services. Is there a way/tutorial for ftp/database transfer? We have install simple wordpress on Google instance. We can’t access to the orig page we are tranfering to Google cloud… We only have it all files and database. We successfully uploaded/rewrote the files to the GC… and install the database but the website doesn’t work. Everything should be fine.. so, the question is… Is there any special GC setup/file of wordpress that we need to include/add to it to make it work? Maybe commands to fix the permissions? Why can’t you run the All-in-One WP Migration plugin? You can manually migrate your database, but there’s a lot of effort and troubleshooting involved. Like you said, the main issues you will encounter will be permissions related, but there might also be issues with directory structure and file/plugin dependencies. Let me know more about your situation and why you can’t use the All-in-One WP Migration plugin and I will try and help you troubleshoot. Plesk can be confused, so, I changes the following in wp-config.php and now I can see the preview. I’m glad you’re making progress – I wish I could be of more help but unfortunately it’s not a simple process. Some resources that I’ve used that you might find helpful include WordPress Codex and this BlueHost article. It seems like you have experience with this stuff, so I will leave you to it. Let me know if you have any questions or run into any conflicts and I will try my best to help! After importing, I was sent back to the WordPress login page, where neither the admin username/password nor my email address are recognized. Help! You have to use the WordPress username and password of the site that you imported. So if you imported website A to website B, you would use website A credentials to login to website B. Excellent resource for newbie developer but I was curious about what if the website size is more than 2 GB? I have hosted my site on shared hosing account and now I am planning to move it on managed cloud hosting platform like Cloudways or may be Siteground. 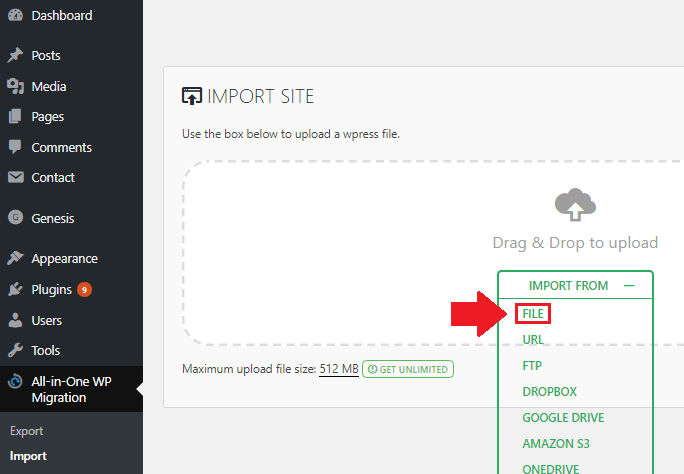 Infact Cloudways have their WordPrss Migration plugin as well. Which plugin do you suggest should I use? Duplicator, All in One WP Migration or Cloudways Migrator. All-in-One is the easiest and quickest to use – in my opinion. Check out this tutorial on how to increase the upload limit to over 2GB. Since we are restoring the contents (data base level) from site A to B, you will have to use password of site A. On my bitnami multisite install I’m not allowed to use this plugin. Do you get an error message when you try to use the plugin? I am curious to know – this will affect a lot of users if the plugin isn’t working. I’m not getting any error message. Simply, I’m not able to import anything. The plugin is there activated on my network but I can’t manage it. No links, no field created under site panel nothing nothing nothing. I didn’t realize that the plugin doesn’t work for multi-site installations. Thank you for bringing this to my attention – I will be sure to make a note of this in order to inform other multisite users. Bitnami and Click-to-Deploy are simply the ‘packages’ of software that are supporting your WordPress installation. The plugin in this tutorial is available for any website running WordPress. 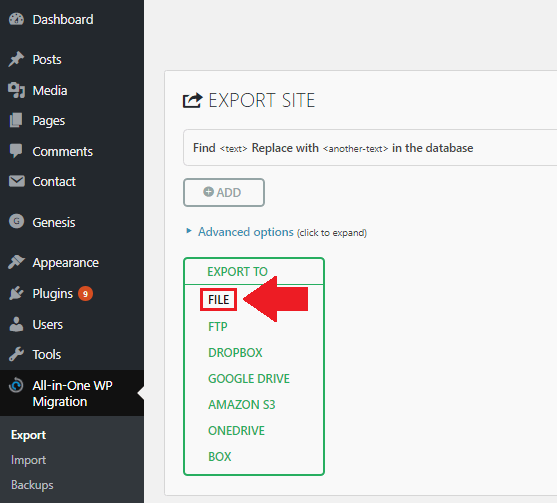 If you can’t get the plugin through your WordPress plugin page, you can download it from the WordPress website then upload it manually to your WordPress plugin dashboard.